Welcome to my new romantic thriller series, Caribbean Tremors. When complete, it will feature three novels. Publication date is November 12, 2018. Both books are now available for pre-order at most ebook stores for the unbeatable price of $0.99. Liberty “Libby” O’Neill has it all. A business partner-fiancé she adores. A thriving Victorian restoration business in San Francisco, a city forested with raw material sufficient to keep them employed—and comfortable—for years to come. Then, why the sense of dread stirring her from sleep at 3 a.m.? Why the sudden terror? The cold sweat? This makes no sense, she tells the darkness. But it does. Libby awakens to reality of imminent bankruptcy after her fiancé abandons her, absconding with all the company’s cash. In desperation, she hires a half-demented street person, known only as Painter, to help her complete a Victorian restoration that can save her from ruin. As work progresses, Libby discovers a surprising reserve of wisdom in her new assistant. The restoration of the grand 19th century house parallels the transformation both Libby and Painter lives, as individuals and, over time, with each other. Their working relationship faces a severe challenge, when she discovers that her homeless day laborer is someone quite other than a street person who spiraled into booze-driven self-loathing. Can their mutual healing survive revelation of Painter’s true identity? Or are they each too irreparably broken to put their lives together and become whole—for themselves and for each other? I’m a native Californian now living in the San Francisco East Bay Area. I was born into a theatrical family and began my career in the arts at the age of 7, with my big sister, doing bit parts that required Italian-looking kids. My sister used her magnificent coloratura voice to pursue a career in grand opera. By my teens, I had taken a different road into academics and spirituality. Although I did a lot of writing (mostly on Christian themes), I did not get the book-bug until my forties. Once the muse bit me, I couldn’t stop and have written 12 books through both commercial and independent publishing. These include both fiction and non-fiction. My most recent fiction works are the Caribbean Tremors Trilogy: A Love Forbidden, Finding Isabella, I’ll Paint a Sun. Just released. My Caribbean Tremors Trilogy is now complete. 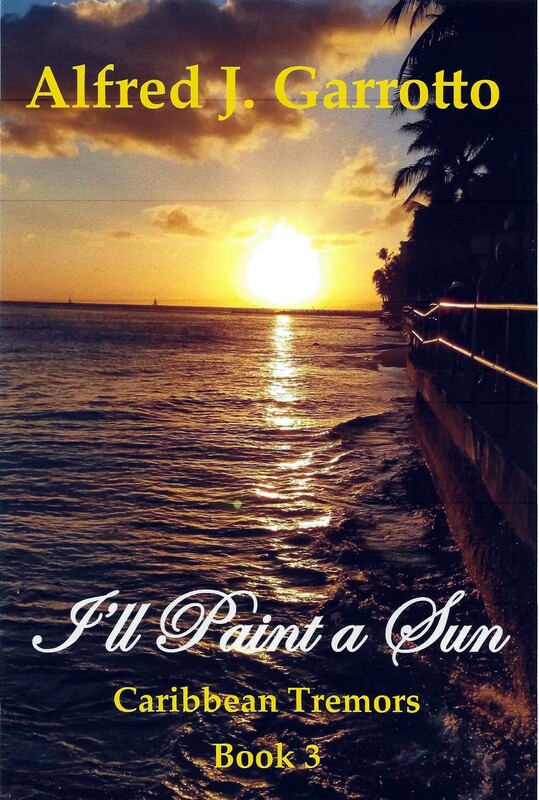 Book 3, I’ll Paint a Sun is now available in e-book format (only) on Amazon.com and Smashwords.com for the low price of $0.99. Liberty “Libby” O’Neill has it all. A business partner-fiancé she adores. A thriving Victorian restoration business in San Francisco, a city forested with raw material sufficient to keep them employed—and comfortable—for years to come. Then, why the sense of dread stirring her from sleep at 3 a.m.? Why the sudden terror? The cold sweat? This makes no sense, she tells the darkness. Libby awakens to reality of imminent bankruptcy after her fiancé abandons her, absconding with all the company’s cash. In desperation, she hires a half-demented street person, known only as Painter, to help her complete a Victorian restoration that can save her from ruin. As work progresses, Libby discovers a surprising reserve of wisdom in her new assistant. The restoration of the grand 19th century house parallels the transformation both Libby and Painter lives, as individuals and, over time, with each other. Their working relationship faces a severe challenge, when she discovers that her homeless day laborer is someone quite other than a street person who spiraled into booze-driven self-loathing. Can their mutual healing survive revelation of Painter’s true identity? Or are they each too irreparably broken to put their lives together and become whole—for themselves and for each other? Coming soon to your favorite ebook seller . . .
Caribbean Tremors–Book 1 . . .
Click on the above link to watch the book trailer here . . .
Caribbean Tremors . . . Book 2 . . .
FINDING ISABELLA by Alfred J. Garrotto . . .
Based on the presenter’s acclaimed book, The Soul of Art, this workshop/retreat focuses on the creative gifts of both professional and aspiring actors, composers, dancers, fine artists, musicians, playwrights, writers, et al. The God-given talents of artists of all genres uplift humankind and lead audiences to deeper awareness of life’s higher meaning. Participants will explore the divine source of their own gifts and inspirations and take away with them even greater joy in sharing them. Attendees of all faith are invited. Alfred J. Garrotto is the author of twelve books (both fiction and non-fiction). Born into a theatrical family, he began working in films (crowd scenes) at the age of seven. The arts in all forms are his lifelong passion. The Soul of Art is now available for purchase in both paperback and E-book formats on Amazon US (www.amazon.com/s/ref=nb_sb_noss?url=search-alias%3Dstripbooks&field-keywords=garrotto+soul+of+art) and will soon be available through Amazon in Europe, Australia, and Asia. “The wisdom and guidance offered in The Soul of Art motivates artists to ‘never give up,’ but rather to seek ever higher goals in their art form, knowing always that what we have is a God-given gift and privilege.” — Andrei (Bill) Tremaine, artistic director, choreographer and premier dancer – soloist, Ballet Russe de Monte Carlo — and founder of The Pacific Ballet Theatre. Born into a theatrical family, Alfred J. Garrotto began working in films (crowd scenes) at the age of seven. Much later, he settled into a writing career (fiction, nonfiction, and poetry). The arts in all forms are his lifelong passion. The Soul of Art is his 12th book.